For only four days this week we were certainly very busy! 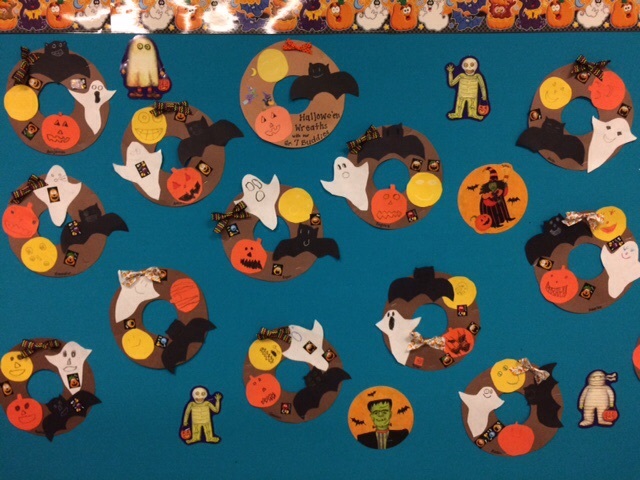 Fine motor skill work was certainly at the forefront of everything we did during this rainy October week. 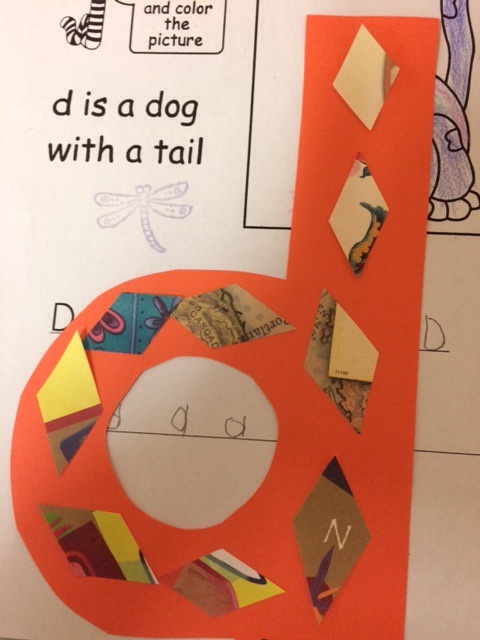 We finished the letter D in our Alphabet Books, and made these super cute diamond D’s as our craft. We will send home the children’s printing sheet and their craft in the next few days. The children learned about colour mixing yellow, orange and red to make various versions of orange for our Painted Pumpkins. We started by using introducing pastels to the children which they love, because they are so smooth and give lots of colour without having to press too hard. After drawing the outline and ribs of the pumpkin as a full group, they mixed their colours using their pumpkin drawing as a palette. We want to provide multiple opportunities to use a variety of art tools and materials for our students to discover ways to creatively express themselves individually and as a group, and to see their work as a means of connecting with, and communicating their ideas, with the greater community. This project is from Deep Space Sparkle, our favourite Art website by Patty Palmer. Patty is a true inspiration for teachers and students alike! Wednesday is the most highly anticipated day of the week as it’s Buddy Time in the afternoon. We’re starting to get ready for Halloweèen, so each Little Buddy made a Hallowe’en wreath supported by his or her Big Buddy. Our children are beginning to use a variety of tracers and templates – manageable for small hands, using both hands at the same time (writing hand, helping hand), and LOTS of scissor and gluestick work. A few stickers and a pretty bow make these little wreaths something very special! We are really pleased with the children’s developing independence at managing their raincoats and boots. On a really rainy day, your child is changing their shoes 4 times – at morning recess, after morning recess, at lunch recess and after lunch recess. Needless to say, they’ve all become quite proficient with their boots after the downpours we’ve been having this week. You can see why slip-on shoes work best for us. We’ve been trying to help the children pull their sleeves back through their jackets before hanging them up. Admittedly, we’ve been having quite a bit of fun watching the teachers put their arms through the sleeves and flap around like a bird, but any teaching you can do at home would be very helpful! Thank you. On Thursday, along with many others, Ridgeview conducted an Earthquake Preparedness Emergency Drill. In class, we told our children ahead of time this event was going to occur and that we need to practise so that in the event of a real emergency, we would be ready. We reviewed “Drop, Cover, Hold” moving quickly but calmly to the tables to crawl underneath, and counted to 60 as instructed. Here was another valuable opportunity for us to focus on the importance of our self-regulation; as the teacher counted, children could count as well (and many did) or they could focus on their breathing as a means of helping them to stay calm and focused. We reassured the children that although they may feel scared and want their parents, we were very experienced in looking after our classes during these sorts of drills and would take very good care of them if there was ever a real emergency. right away. If you have not already signed up for a conference time please do so Monday. October 31st we will hold our annual Hallowe’en Parade. The students are allowed to wear their costumes for the parade. Parents are invited to watch the parade in the hallways. We ask that costumes not be too scary as this can be extremely frightening for some students. Swords, wands, or other costumes accessories that need to carried should be left at home. After the parade students will change out of their costumes into their regular clothes. Ridgeview is also participating in the “We Scare Hunger Campaign”. We will be collecting non-perishable food items for our sister school, Grandview Elementary. Grandview is an inner-city school in Vancouver. The school has a food bank directly in their school that parents and students often visit daily. When choosing items to donate please encourage your child to help pick a few things they might really enjoy themselves. Our hope is to fill Ms. Wilson’s (our grade 7 buddy teacher) truck full of donated food!